It started with Joe Fresh Style. This ad, in fact. There is, of course, another page to the ad. 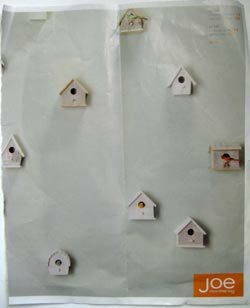 With the wonderful grey-green wall colour, white-washed bird houses and the Joe Fresh Style bright orange logo (below). An orange found in the colour of my couch. Perfect. Let's find that colour. And the search began. 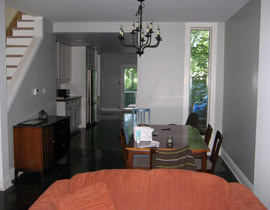 I settled on Oyster Bay by CIL but got it colour-matched for Behr-brand paint. Last weekend and on Canada Day, me and my mom painted. Because I was sick of the plastic wrap over all my furniture and floors. We painted and painted. I sweated a lot. And I grumbled because I really wanted to be outside, enjoying myself in the lovely weather. My mom was a machine. She always is. It took a whole lot less time than it could have. And it's done. And the plastic is gone. It turned out different. Nice. But different. It's certainly fresh. It's much more grey than I thought it would be. Much more like the photo I took of the second page of the Joe ad I ripped out of the magazine turned out. Even though in the magazine it looked like the colour in the picture above. Let me know if you have ideas for art. And other stuff. Honestly, I'm so DONE with this. I'm stressed out and a bit miserable right now, sadly. I'm mad at myself for being so down when I should be enjoying all of this. So I think it's time to take a break. I'm still going to finish a few small things, but I just need some time right now. To enjoy. And Be.